So, how did you celebrate this New Year eve? Hope you had a great fun along with your family and friends. Wishing all of you a healthy life and fun filled prosperous year ahead! 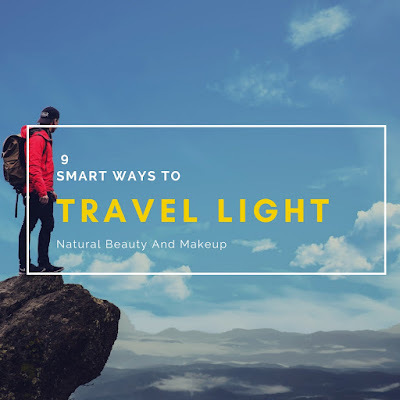 We all know that, the more you have a healthy skin, the more you glow. This is so true and we should follow this in every aspect of our life. Just like cleansing, scrubbing is also important for our skin. But the trickiest part is to choose the right product, isn’t it? 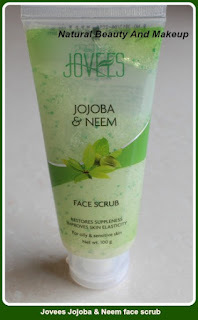 So today’s pick is ‘Jovees Jojoba & Neem face scrub’, let’s see how it fared for me. 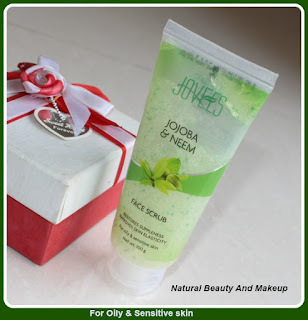 Jovees Jojoba & Neem face scrub is a gentle scrub, which contains fine jojoba beads and neem along with other botanical nutrients that cleans the skin, removes excessive oil and dull skin cells without rupturing the skin. It also helps to improve skin elasticity and suppleness. Claims: - Restores suppleness and improves skin elasticity. 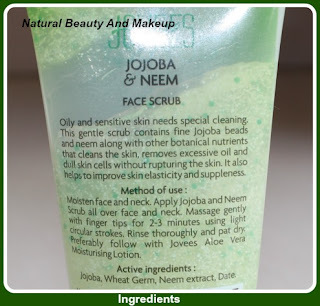 How to use: - I apply Jojoba & Neem face scrub all over my moistened face and neck. Then massage gently with finger tips for 2-3 minutes using light circular strokes. After that, I rinse thoroughly and pat dry. It has a see through tube type packaging with a sturdy flip top cap. 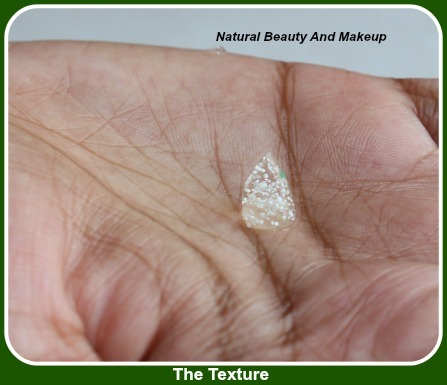 The scrub looks like green colour from the outer side but is actually transparent gel type with white and green micro beads in it. Green colour is partly due to the outer green cover on the tube, where the full details are printed. The scrub has a gel type texture. You can see there are white and green micro beads in it in the picture below. It has a fruity smell, though does not linger for long. The consistency is thick but no fuss while application. 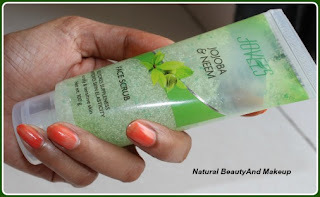 I bought this scrub few months back while buying few other beauty products for me. I actually got bored of using Everyuth scrub, so thought to try a new product this time. Jovees is a well known brand for its quality herbal products in their skin, hair and body care segment. I’ve used Jovees henna and face packs in my college days, got good results too. So without any doubt I picked this up and came home happily. 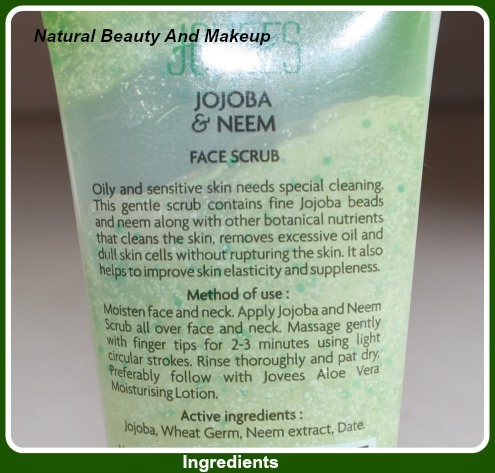 This Scrub from Jovees is meant for oily and sensitive skin and its star ingredients are Jojoba, Wheat germ, Neem extract and Date. We know thousand skin benefits of Jojoba, Wheat Germ and Neem but Dates? My god, I used to eat Dates just to gain weight, but Dates are equally good for elasticity & anti ageing of skin, WOW!! Coming to the point of scrubbing action, the performance is good. The texture of this scrub is gel based and has jojoba and neem micro beads in it, which leaves a mild and soothing scent. You need a good amount of it on the palm to scrub your face. At first, I was skeptical of using it on the skin directly for these beads as it might hurt my skin and I didn’t want to do more damages on skin than good. But on application, it feels so soft and the granules even do not hurt rather I felt it scrubbing away all the dirt & oil from my skin. Post wash, my skin felt soft and supple, and no dryness; followed it with my rose toner. I usually do not scrub daily, but it is a gentle mild scrub, so it can be used daily. I did not find any problem keeping this in my bag while travelling even. Out of 5 star, I would give it 4 rating. I have a combination skin, little bit on oily side and this scrub worked good for me. I would not say that I noticed any huge difference, but yes it didn’t do any damage also. Beauties with oily & sensitive skin may try this at least once , but my hunt for HG scrub is going on!! Have You Tried This Jovees Scrub Yet? If Yes, Then How Did You Find It? Please Share Your Experience With Me In The Comment Section Below And Do Not Forget To Follow & Subscribe NBAM!! Haven't tried this, infact anything from Jovees yet. Great review. Thank you Sonali :) Yeah try it once and let me know how did you like it!